Q: How much time does Marching Band take? Will I have the time? A: For most weeks, the marching band rehearses five times a week for one hour and twenty minutes a day (5:10 – 6:30 p.m.), and on the day of the game for about an hour and a half in the morning. Students rarely drop marching band because of time problems. Our students see marching band as their time to get outside and take a break from the lecture halls and labs, play great music, and be among close friends. Q: How many performances does the Marching Band have? A: The ISUCF’V’MB will perform at all home football games. The band also performs in the annual Band Extravaganza at the C.Y. Stephens Auditorium on campus, which also features the Wind Ensemble and Jazz Ensemble. In addition, we travel to all post-season bowl games. A: Visit the How to Join section of the website! Drumline, Twirlers, and Guard have separate auditions for the band. Please check the calendar or their web pages for these dates and times. Incoming wind players will audition at the end of rookie camp in August. All new members should complete the Band Application form and attend the Band Orientation meeting during summer orientation. A: Tell your advisor you want to be involved in Marching Band and sign up for Music 114A during course registration. Q: What if I have a class conflict with Marching Band? A: If a class conflict cannot be avoided, don’t assume that you cannot participate! We understand that there are many lab and course conflicts with marching band during the week. If you have exhausted all other scheduling options, we do permit first-year members to miss one rehearsal per week due to a class conflict (work and other personal conflicts are not permissible). Returning members are allowed two class conflicts per week. Q: As a Marching Band member, how much should I expect to pay? A: There is a fee at the beginning of the semester (around $90) to cover the cost of uniform cleaning, 2 band shirts, an official band baseball hat, a water bottle, and other miscellaneous items. There is also a small fee (around $15) if you wish to rent a locker in the Music Hall. All members will march in a shoe custom-made for the band, at an additional expense; these shoes can last years if properly maintained. If you need to rent an instrument or equipment, including drumline, flags, and sousaphones, there is an additional rental charge. All charges will automatically appear on the student’s U-Bill. The university pays for all travel-related expenses. Q: Obviously there are huge costs for the marching band. As an alumnus, parent, or friend of the band, how can I help? A: We have a special program set up for just that! 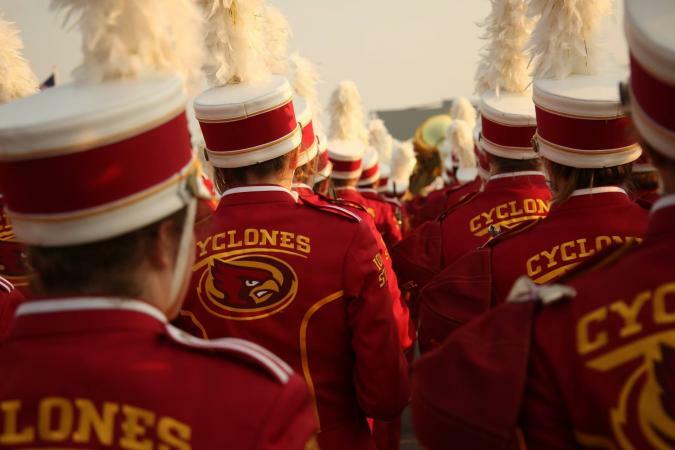 The ISU Department of Music and Theatre and the Iowa State Foundation are working together to offer the Adopt-the-Band program. Find out more about how you can help. Q: How do I get into Basketball Pep Band? A: More information about Pep Band will be available during the Marching Band season. Q: Why is it called the ISUCF’V’MB? A: We’ll tell you when you get here!